So, it’s officially spring in the Northern Hemipshere. Good news too, given we’ve had a pretty heavy winter here in Blighty. And what’s it like out today? Are lambs to be seen leaping in lush, green meadows? Are daffodills sprouting all over the shop and turning the land yellow? Are rabbits, er, you know… like rabbits? Well, a quick look out of the window tells me… no. Looks like it’s going to be another cloudy, sorry, rainy day again. And, in any case, did spring start this weekend? I was always under the impression it began on the 20/21 March, the date that’s halfway between the winter and summer solstices, but it seems nowadays many – especially in the media – don’t go by that anymore and just state that spring officially starts on 1 March. Hmmm, odd. Who knows? 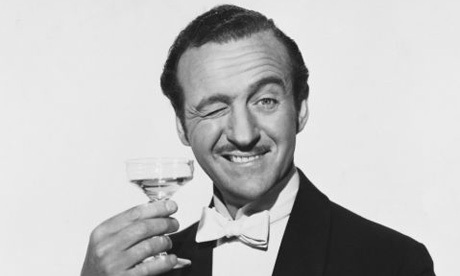 Oh well, at least I found out, literally today, that there is something we can celebrate, all optimistic-like, with it being the beginning of spring (whether it happened this weekend or 1 March), because on the first day of this month, had he lived, David Niven would have reached the milestone age of 100 years young. Yes, Niv. Hollywood’s English gent extraordinaire and genuine wartime hero, serving with the British commandos during World War Two, as he did. Methinks it’s almost impossible not to admire and like him; he had an endearingly easy-going air on screen and a wicked, wonderful wit that went hand-in-hand with his reputation as a first-rate raconteur. Niven was born on 1 March 1910 in London and, following generally unhappy spells at British boarding schools, he drifted into the army. Discovering that wasn’t to his taste either, he jacked it in and fled to the US. After a few oddjobs (including cleaning and polishing rifles for hunters in Mexico) he found his way to Hollywood in 1933. There, he won himself a contract under legendary producer Samuel Goldwyn, which saw him appear in films like The Charge Of The Light Brigade (1936), The Prisoner Of Zenda (1937), Wuthering Heights (1938) and Raffles (1939), in which he played the lead. At this time, he shared a house with hell-raising heart-throb pal Errol Flynn, which they nicknamed ‘Cirrhosis-by-the-sea’. Then the war came. He returned to the UK and was re-commissioned as a lieutenant in the Rifle Brigade in February 1940, before transferring to the commandos. He took part in 1944’s Normandy Landings, although he went over to mainland Europe a couple of days after D-Day (4 June), and in working with the Army Film Unit, he made two (essentially) propaganda pictures for the British war effort, The First Of The Few (1942) and The Way Ahead (1944). Following the war, he was out in the wilderness for a few years when it came to Hollywood, but during this period he starred in Powell and Pressburger’s British masterpiece A Matter Of Life And Death (1946), in which he played a downed RAF officer convinced he shouldn’t be sent to heaven but allowed to live again. Back in the US, he returned to the big time by playing Phileas Fogg in the multi-Oscar-winning Around The World In 80 Days (1956), and his star coninued to rise with his role in Separate Tables (1958) winning the Academy Award for Best Actor. Combining TV work with his film career, he went on to star in another 30 movies – most notably The Guns Of Navarone (1961), The Pink Panther (1963), the poorly received spoof Bond Casino Royale (1967), Murder On The Orient Express (1976), Candleshoe (1977), Death On The Nile (1978), Escape To Athena (1979), The Sea Wolves (1980) and the final two underwhelming Pink Panther sequels Curse of the Pink Panther (1982) and Trail Of The Pink Panther (1983). By this time, in his seventies as he was, he was beginning to suffer from ill health – amyotrophic lateral schlerosis, to be exact. Sadly, it was from this disease he died on 29 July 1983 at his Swiss chalet home. He was married twice; first to the wondefully named aristocrat Primula Rollo (1940–46), and following her death owing to a tragic accident at the home of film star Tyone Power, second, to Swedish model Hjördis Tersmeden (from 1948 until his own death). Theirs was a stormy marriage, with affiars on both sides (his reputedly including both Grace Kelly and Princess Margaret); she didn’t even attend his funeral and, upon her death in 1997, was not buried alongside him. He was survived by two sons, two adopted daughters (one of whom is believed to be his biological daughter out-of-wedlock) and four grandchildren. Niv led – and had – a full life of dramatic highs and lows; fittingly so for one whose star shone as brightly as his did in the 20th Century’s firmament. He’ll always be remembered as the epitome of the unflappable English gent and as one of the greatest and funniest of storytellers – indeed, don’t take my word for it, check out his two outstanding, best-selling autobiographies The Moon’s A Balloon (1973) and Bring On The Empty Horses (1975). He was a fine fellow indeed. Ian Fleming described him as the only honourable man in Hollywood. Yep, he was a fine feller, indeed…!